Ariel Anders, Levi Miller, Jacob Rosen Bionics Lab, University of California, Santa Cruz. 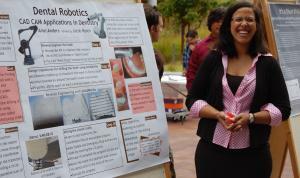 The success of applying robotics to the medical field has opened a new frontier with vast areas for expansion and exploration; more specifically, robotics with dental application is a relatively untraveled area to pursue. My research in designing a prototype to automate the drilling of a tooth pushes the limits of innovation in research and technology as well as decreases the gap between engineering and medicine. My approach followed the robotic paradigm: Sense, Plan, and Act. I used a 3D digitizer to “sense” the tooth by producing a series of XYZ points. In “Plan”, I used Solidworks to create a mesh from the points; then I created section boundaries around this 3d model. I wrote a script to analyze the coordinates from the boundaries to produce a program. Lastly, the robotic arm “acted” by executing this program. The results from the first test run produced a tooth drilled on the section paths with the exception of one side; also, a small portion of the center of the tooth was drilled as well. The tooth was slightly rotated causing the flaw; also, I had not programmed moving to different boundaries making the robot use its spline function, causing the noise in the center. In conclusion, these results reached my expectations of a first test run; with a versatile robotic arm, scanner, and software this prototype was accomplished within ten weeks, proving that robotics in dentistry is achievable and is an endeavor to pursue.